Participation in recommended levels of physical activity reduces with age,1 and these reductions are associated with reduced physical function,2,3 increased mortality,4 and reduced independence.5 Additionally, impairments in mobility predict future disability and reduced independence in older adults.6 While undertaking appropriate levels of physical activity is known to improve health outcomes in older adults and prevent declines in mobility,7 many are unable to achieve current recommendations.8 As such, interventions that are attainable and can promote maintenance of mobility while supplementing physical activity are essential for older adults. The use of motor imagery, the imagining of an action without its physical execution,9 is one potentially feasible intervention to prevent declines in mobility. Motor imagery elicits activity in brain regions that are normally activated during actual task performance,10 and the spatiotemporal characteristics of imagined and physical movements are very similar for straight-line locomotion.11 Notably, there is less similarity between the spatiotemporal characteristics of imagined and executed movements for complex locomotor tasks12 and whole body transfer tasks such as sitting from standing.13 This discrepancy between imagined and executed tasks for more complex movements is important as these complex movements may be more prone to deterioration and impairment in older adults, with such impairments leading to a loss of mobility and reduced independence.6,14 As such, it is important to understand how motor imagery may influence complex locomotor tasks in older adults to identify how motor imagery could be best used as a rehabilitation tool to assist in maintaining mobility and independence in this growing sector of our population. Motor imagery is believed to utilize the forward internal model which mimics the causal flow of the physical process by predicting the future sensorimotor state of the body based on the efferent copy of a motor command and the current state.15,16 Motor imagery relies on the efferent copy and working memory of that task to establish state estimation as there is no sensory feedback, whereas in the physical performance of a task, state estimation is based on both the forward model and the sensory feedback.17,18 The utilization of these forward models within the motor planning process during both imagined and executed movements provides a parsimonious reason for the similar timing between imagined and executed movements.19,20 Unsurprisingly, the ability to imagine more complex locomotor tasks is less accurate compared with simple tasks,12,21 which may have implications for rehabilitation in older adults. Quantify the learning process during one session of locomotor motor imagery training and compare it with the learning process of physical training. Assess whether one session of motor imagery or physical training can improve task-specific locomotor performance. Adults aged 65–85 years were invited to take part in this randomized controlled study. To be included, participants needed to be community dwelling, independently mobile, and be able to commit to the study time frames. Exclusion criteria were any falls in the past 12 months, use of a walking aid for mobility, acute or terminal illness, unstable cardiovascular and/or respiratory disorder, neurological disease, and joint replacement in the past 6 months. Participants attended one session (90 minutes) at the university gait laboratory. The study was approved by the Human Research Ethics Committee of the Australian Catholic University and was prospectively registered with the Australian New Zealand Clinical Trial Registry (registration number: ACTRN12617000122358). After providing written informed consent, participants completed questionnaires relating to demographics, physical activity levels (rapid assessment of physical activity [RAPA]), cognition (miniCOG), and imagery ability (kinesthetic and visual imagery questionnaire [KVIQ]). Then, they underwent a series of baseline locomotion tasks, completed a 30-minute training session, then concluded with reassessment of locomotion tasks (Figure 1). Figure 1 Flow diagram of study. Participants were randomly assigned to one of three groups following baseline testing, which determined their activity for the training session – motor imagery (MI) training group, physical (P) training group, or control (C) group. Randomization occurred via participants selecting an opaque envelope that contained their group allocation. The chief investigator was not able to be blinded to participant group allocation within session as he was responsible for administering the tests, but he was blinded to group allocation during data analysis. An academic staff member not involved with the study prepared and de-identified the data via computer-generated random number sequencing prior to analysis by the chief investigator. All questionnaires were completed at baseline testing prior to locomotion assessments. The 10-item KVIQ (KVIQ10) was used to assess the imagery ability of participants.33 Participants were required to perform a series of movements, then imagine performing that movement, and then rate the clarity or intensity of their imagined movements. The scale assesses both visual and kinesthetic imagery with each dimension being scored from 5 to 25 with higher scores indicating greater imagery clarity or intensity. Gait speed was assessed for preferred walking speed and fast walking speed on the GAITRite system (GAITRite Gold; CIR Systems, Franklin, NJ, USA). The GAITRite incorporates an electronic walkway ~8.2 m long with an active measuring electronic surface that measures step-by-step spatiotemporal data. Participants walked in a quiet, well-lit room wearing their own footwear. For preferred walking speed, participants were instructed to “walk towards the end of the room at a pace that is comfortable for you”, and for their fast walking trials, participants were instructed to “walk towards the end of the room as fast as you can safely without running”. Participants started walking from a line marked 2 m before the start of the GAITRite walkway and ceased their walk ~2 m beyond the walkway to allow for the capture of steady-state speed and to negate acceleration and deceleration influences. Participants completed one practice trial and two recorded trials for each condition. The mean of the two recorded trials was used for analysis. From a seated position in a chair, on the command of “go”, participants were required to stand up, walk 3 m as quickly and safely as possible past a line on the floor, turn around, walk back to the chair, and sit down with their back against the chair.37 Time started on “go” and stopped when the participant had their back against the back rest of the chair. The mean of two trials was used for analysis. The imagined timed-up-and-go (iTUG) was developed to determine whether a motor imagery task could be used as an assessment tool in older adults and has been used to identify adults with mild cognitive impairments.38 Participants remained seated in a chair and were instructed to imagine doing the timed-up-and-go (TUG) and to say “stop” out loud when they were finished with their back on the back rest of the chair. Time started on the command “ready-set-go” and stopped when the participant said “stop”.39 The mean of two trials was used for analysis. The mean difference (TUG delta) between the physically performed TUG and the iTUG was then calculated39 according to the following formula: [(TUG-iTUG)/(TUG±iTUG/2)]×100. A positive delta value indicated that participants performed the imagined task quicker than the physical task (expected pattern). The higher the positive values, the greater the time difference between imagined and physical task performance. Conversely, a negative value indicated that participants performed the imagined task slower than the physical task. Figure 2 Schematic of obstacle course. Participants in the physical training group completed 20 physical repetitions of the obstacle course. Participants were instructed to “complete the obstacle course as quickly and accurately as possible”. The time taken to complete each repetition was measured – time started on “go” and stopped when the participant had their back against the back rest of the chair. Participants had a 30-second rest between each trial, then a larger 5-minute rest after 10 repetitions. A trial was repeated if a participant knocked over a marker or hurdle. Participants in the control group spent 25 minutes (equivalent time as motor imagery and physical training including rest periods) playing mentally stimulating games on an iPad. Participants had the choice to play a mathematics game (Sudoku), a word finding game, or a trivia game, or a combination of these games. These mentally stimulating games were performed so that control group participants should be mentally stimulated to more closely match the mental demands of motor imagery and physical training without a particular focus on bodily movement. All statistical analyses were performed using IBM SPSS (Version 22). Statistical significance was set at p≤0.05. Analysis of variance (ANOVA) was used to identify any baseline differences between groups. To quantify the learning process associated with motor imagery training, trial-by-trial changes during training sessions were analyzed using repeated measures ANOVA, within group differences at four time-point clusters (repetitions 1–5, 6–10, 11–15, and 16–20, respectively) were compared. Trial-by-trial changes during training sessions were analyzed using repeated measures ANOVA for repetitions 1, 10, 11, and 20 to identify whether a larger break after repetition 10 affected the duration of subsequent repetitions. The coefficient of variation (CoV) (SD/mean×100) for each participant’s training session (20 repetitions) was calculated to determine the variability within each training session (motor imagery and physical). Independent samples t-tests were then performed to identify differences in the overall CoV between the motor imagery and physical training sessions. Paired samples t-tests were used to determine whether baseline obstacle course times differed from the mean time of all training repetitions in each training group. Thirty adults aged 74±5 years took part in the study. There were no significant differences between groups at baseline in any demographic or outcome measure except for RAPA (aerobic) where the motor imagery training group was significantly more active than the physical training group. Demographics and baseline measures of the cohort are presented in Table 1. Notes: All values are presented as mean±SD. aSignificantly different (p<0.05) from other groups at baseline. Abbreviations: BMI, body mass index; CoV, coefficient of variation; iTUG, imagined timed-up-and-go; KVIQ10, 10-item kinesthetic and visual imagery questionnaire; miniCOG, cognition; RAPA, rapid assessment of physical activity; TUG, timed-up-and-go. There were significant changes in the duration of repetitions from repetition 1 to 20 for both motor imagery and physical training whether they were assessed in clusters or as individual repetitions. The pattern of learning represented by the within session changes was different for each group (Figures 3 and 4). The motor imagery training group had an increase in imagined time over the course of training while the physical training group had a reduction in physical performance over the course of training. Additionally, the time to physically complete the obstacle course at baseline was significantly greater (p=0.009) than the mean time to complete the imagined repetitions of the obstacle course (Figure 4) in the motor imagery training group. There were no significant differences between the time to physically complete the obstacle course at baseline and the mean time to complete all 20 training repetitions (p=0.42). 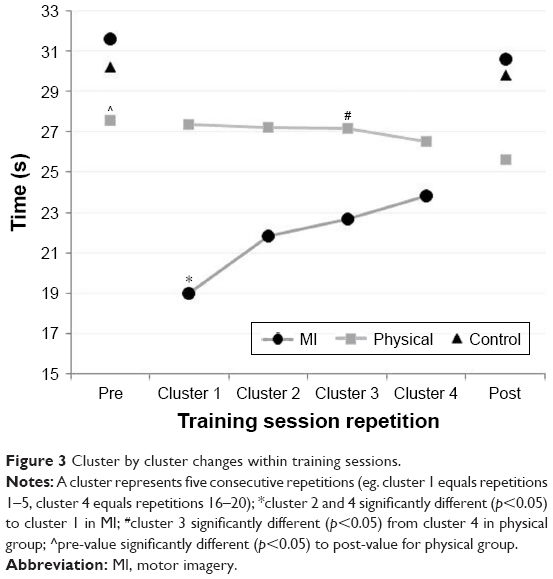 Figure 3 Cluster by cluster changes within training sessions. Notes: A cluster represents five consecutive repetitions (eg. cluster 1 equals repetitions 1–5, cluster 4 equals repetitions 16–20); *cluster 2 and 4 significantly different (p<0.05) to cluster 1 in MI; #cluster 3 significantly different (p<0.05) from cluster 4 in physical group; ^pre-value significantly different (p<0.05) to post-value for physical group. Figure 4 Trial by trial changes within training sessions. Notes: *repetition 10 and 20 significantly different (p<0.05) to repetition 1 in MI; #repetition 10 and 20 significantly different (p<0.05) from repetition 11 in MI; ^repetition 10 significantly different (p<0.05) to repetition 20 in physical group; $baseline value significantly different (p<0.05) from mean time to complete imagined repetitions in MI. There were significant group differences between physical and motor imagery training for training variability as measured by the CoV. 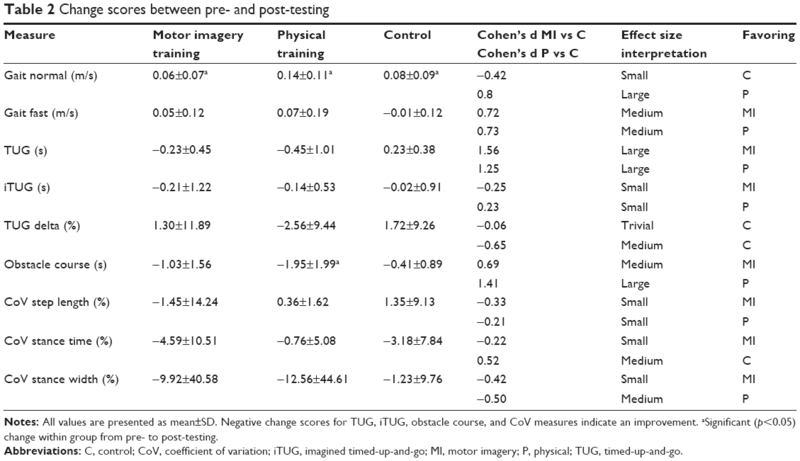 The CoV for motor imagery training (13.4±7.0) was significantly greater (p<0.01) than CoV for physical training (3.6±1.3). There were no significant differences in change scores for any measure between groups (Table 2). Although there were no significant differences between groups, there were medium to large effect sizes for gait speed (fast), TUG, and obstacle course time, all of which indicated a greater improvement in the training groups compared with controls. Notes: All values are presented as mean±SD. Negative change scores for TUG, iTUG, obstacle course, and CoV measures indicate an improvement. aSignificant (p<0.05) change within group from pre- to post-testing. Abbreviations: C, control; CoV, coefficient of variation; iTUG, imagined timed-up-and-go; MI, motor imagery; P, physical; TUG, timed-up-and-go. There were significant within group improvements from pre- to post-testing for gait speed (normal) for motor imagery (p=0.049), physical (p=0.004), and control groups (p=0.018). There was also a significant reduction in time (p=0.013) to complete the obstacle course in the physical training group (Table 2; Figure 3) from pre- to post-training. 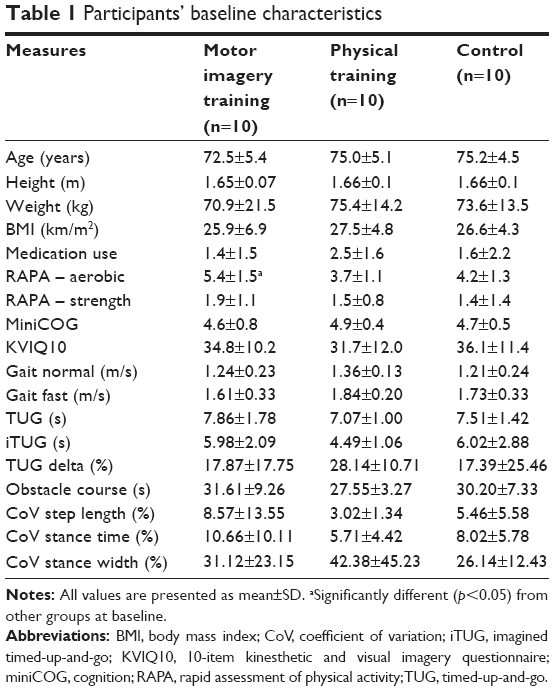 There were no significant changes for gait variability measures in any group. There was very little change in TUG delta scores for any group. For the motor imagery training group, this small increase in TUG delta was a product of small reductions in the time to complete both the physical TUG and the iTUG (Table 2). The main finding of this study is that within session changes in obstacle course performance are evident during both motor imagery and physical training of an obstacle course locomotor task in apparently healthy community-dwelling older adults. The trial-by-trial changes within a single training session differed between the two training groups as an overall increase in imagined time occurred during motor imagery training, while physical training led to reductions in the time to complete the obstacle course. These results are in contrast to previous research that has examined trial-by-trial changes produced by motor imagery training.27 In the Gentili et al27 study, both motor imagery and physical training led to reductions in the time to perform a repeated pointing task. As the temporal pattern of the final repetitions of training closely matched those of the post-training physical performance,27 it may indicate that both motor imagery and physical training shared a similar neuroplastic learning process. 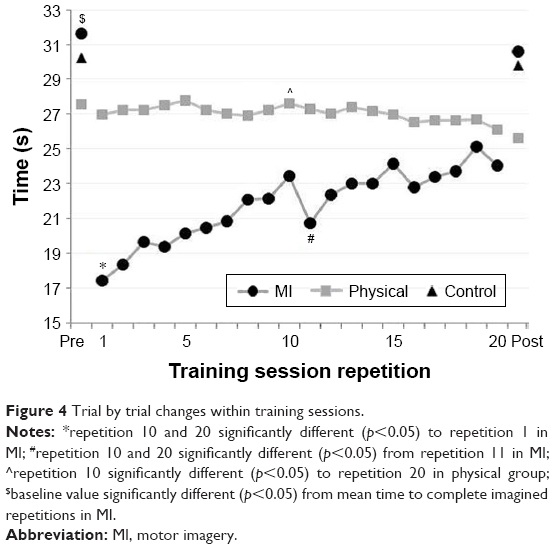 In the current study, despite the mean duration of repetitions increasing over the course of motor imagery training, these within session changes were still likely the result of learning and increased precision27,43 as the temporal pattern of imagined movements at the end of training better represented actual physical performance. 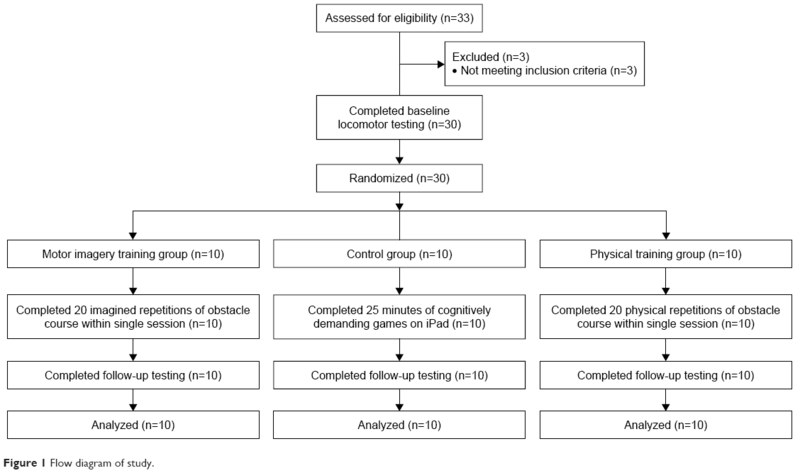 Participants in this motor imagery training group initially underestimated the time to complete the obstacle course as the time to complete the imagined task was significantly shorter than the time to complete the physical task (Figure 4). This finding is in agreement with previous studies where the duration for stand-to-sit movements13 and complex locomotor tasks44 were underestimated by older adults. Importantly, with repeated imagined movements, there would have been ongoing recalibration and refinement of the efferent copy (motor plan) which led to an increase in duration of the imagined movement to better match the physically performed movement (Figures 3 and 4). Additionally, although the overall pattern during motor imagery training produced an increase in the duration of imagined movements, there was an evident reduction in the duration of imagined movements immediately after the larger 5-minute break following the 10th repetition. This finding suggests that the larger 5-minute break following the 10th repetition was enough to temporarily interrupt the ongoing recalibration of the efferent copy (or motor plan). It appears that in the absence of sensory feedback, although the brain is able to modify the efferent copy, a number of repeated imagined movements are required to improve temporal precision.27 Notably, participants in this study had appropriate motor imagery ability as demonstrated by the KVIQ scores which are similar to previous values in healthy older adults.45 This ability to accurately construct mental images is an essential requirement for effective motor imagery as a rehabilitation tool.46 Interestingly, participants in the motor imagery training group consistently reported that they were better able to visualize their feet going through the obstacle course toward the end of the training session which indicated improved image clarity. In agreement with previous studies,11,27 there was greater variability during the motor imagery training compared with physical training in the current study. During imagined movements, forward models generate the prediction of movement timing, but do so via central commands in the absence of sensory feedback which likely accounts for the greater variability in the timing of imagined actions compared with physical actions.17,48 This is particularly evident in successful locomotion, which involves complex and continuous whole body movement requiring continuous adaptation of movement patterns to meet the demands of the environment.11 During physically performed locomotor tasks, sensory information from the moving limbs strongly contributes to modifying the motor command and determining the timing and quality of the gait pattern.49 The reliance on sensory feedback for refining gait timing and quality appears to be more pronounced in more complex gait tasks.11,50 As such, greater timing variability in imagined movements should be expected in more complex locomotive movements that do not have a well-defined working memory in which the forward model can be used to accurately control the resulting movement. In the current study, participants imagined a horizontal walking task that included straight-line walking, hurdle stepping, and direction changes. The forward model relating to hurdle stepping and direction changes would have been less precise than that of normal walking as it was based on a substantially reduced number of repetitions compared with the millions of repetitions of normal walking that is stored in the working memory of healthy older adults. 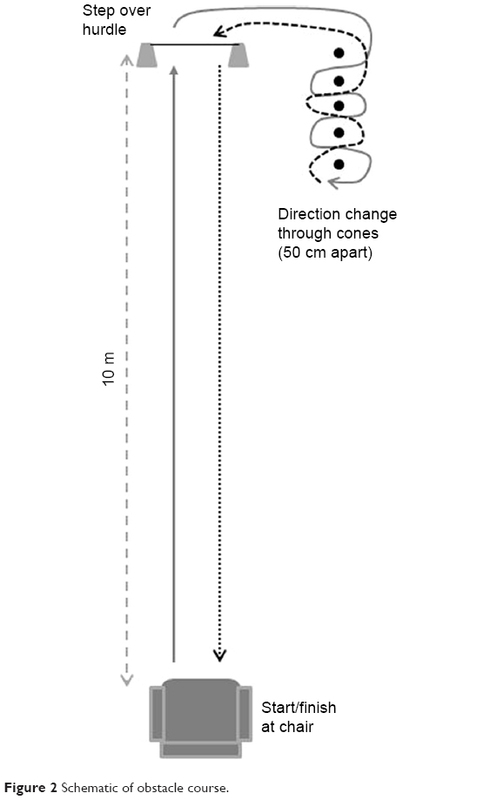 Certainly, more clear and accurate motor imagery is facilitated in tasks that are familiar and have minimal spatial constraints.40 We acknowledge that we did not time the different components of the mobility task such as direction change around obstacles or hurdle stepping, rather the entire task was timed as a whole. In future studies it would be interesting to identify whether the timing accuracy of familiar patterns (eg, straight-line horizontal walking) and unfamiliar patterns (eg, direction change around the obstacles) within the same task differ at baseline and/or respond differently to motor imagery training. The second aim of the study was to determine whether a single session of motor imagery training could produce improvements in older adults’ physical performance. Motor imagery training in this study did not lead to significant between group changes in the time to complete the obstacle course or other locomotor tasks, and there were no significant effects on gait variability measures. There were, however, significant within group improvements for normal gait speed in the motor imagery training group, as well as the physical and control groups. Additionally, there was a significant reduction in time to complete the obstacle course in the physical training group. Medium to large effect sizes were also identified for fast gait speed, TUG, and obstacle course for the two training groups which indicated greater improvements with training compared with controls. Specifically, there were large effect size improvements for the change in TUG time for both training groups when compared with controls. This suggests that imagining the performance of the obstacle course may have resulted in positive transfer to the TUG task. This carryover improvement is not necessarily surprising given that the obstacle course incorporated all the elements of the TUG (ie, sit to stand, walking, turning, and stand to sit), but it does demonstrate the significant potential motor imagery training may play in improving function in older adults. As the current study involved only one session, the improvements in locomotor tasks observed in the current study for motor imagery training are likely to be more evident and clinically meaningful following several training sessions.46,51 More evident changes in gait variability measures may also occur with prolonged and targeted motor imagery training but very little is still known about the potential influence of such a training on gait variability in older adults.35 While more prolonged motor imagery training is likely to further improve locomotor performance, it is essential to identify factors that may have limited performance gains within a single session of motor imagery training, as performed in the current study. The amount of repetitions and the total duration of the motor imagery session used in the current study appear to be appropriate and were consistent with dosages used in rehabilitation46 and sport,47 albeit with these parameters applied only to a single session. The small sample size is a factor that limited our ability to detect significant between group differences but there are also a range of other potential methodological reasons for the lack of between group differences. First, the only instruction provided to the motor imagery training group was to “imagine yourself completing the obstacle course as quickly and accurately as possible from a first person perspective”. This limited amount of instruction was utilized to better represent what might occur in a clinical setting where there are time and personnel constraints. Previous research that has involved multiple sessions and provided more guidance and specific instructions through the use of audio tapes have reported significant improvements in locomotion after several weeks of motor imagery training.51 Second, the study was conducted on healthy, independently mobile older adults, so potential changes in gait speed and mobility-related tasks were somewhat limited compared with older adults with reduced gait speed or impaired mobility.52 As such, future research should identify the within session effects of motor imagery in mobility impaired older adults. Additionally, the motor imagery training may have been more effective if performed in standing as it has been found that adopting a more similar position to the imagined task is beneficial.40,45 Based on these previous observations, it was decided to have participants complete the motor imagery training in sitting as the obstacle course started with a sit-to-stand, but an upright posture may have been more reflective of the entire task considering the obstacle course included straight-line walking, hurdle stepping, and direction changes. It is also acknowledged that greater benefits are likely to have occurred if physical trials were interspersed between blocks of motor imagery repetitions,11 but one of the study aims was to determine the effect of isolated motor imagery training on locomotion. The clinical significance of determining this isolated effect is related to the potential application of motor imagery in older adults who may have mobility impairments or limited weight bearing ability due to illness, weakness, or injury. This study is the first to identify the within session learning process that occurs with motor imagery of a complex locomotor task in older adults. During a single session of motor imagery training, the timing of an imagined locomotor task was refined to better match that of the physically performed locomotor task. Additionally, motor imagery training promoted greater improvements in locomotor performance than controls, indicating that locomotor-related motor imagery can improve mobility in independent, community-dwelling older adults. While future research should assess the time course and dose–response characteristics of the learning process to motor imagery training of simple locomotor tasks, the practical application of these results is that task-specific motor imagery may provide a feasible alternative or adjunct to standard physiotherapy for those older adults who are unable to access supervised rehabilitation services or those who are unable to tolerate weight bearing and task-specific physical practice. The authors thank all the participants who took part in the study. Jefferis BJ, Sartini C, Lee I-M, et al. Adherence to physical activity guidelines in older adults, using objectively measured physical activity in a population-based study. BMC Public Health. 2014;14(1):382. Gennuso KP, Gangnon RE, Matthews CE, Thraen-Borowski KM, Colbert LH. Sedentary behavior, physical activity, and markers of health in older adults. Med Sci Sports Exerc. 2013;45(8):1493–1500. Seguin R, LaMonte M, Tinker L, et al. Sedentary behavior and physical function decline in older women: findings from the women’s health initiative. J Aging Res. 2012;2012:271589. Matthews CE, George SM, Moore SC, et al. Amount of time spent in sedentary behaviors and cause-specific mortality in US adults. Am J Clin Nutr. 2012;95(2):437–445. Hirvensalo M, Rantanen T, Heikkinen E. Mobility difficulties and physical activity as predictors of mortality and loss of independence in the community-living older population. J Am Geriatr Soc. 2000;48(5):493–498. Abellan van Kan G, Rolland Y, Andrieu S, et al. Gait speed at usual pace as a predictor of adverse outcomes in community-dwelling older people: an International Academy on Nutrition and Aging (IANA) Task Force. J Nutr Health Aging. 2009;13(10):881–889. Hinrichs T, Bonsdorff MB, Törmäkangas T, et al. Inverse effects of midlife occupational and leisure time physical activity on mobility limitation in old age – a 28-year prospective follow-up study. J Am Geriatr Soc. 2014;62(5):812–820. Sparling PB, Howard BJ, Dunstan DW, Owen N. Recommendations for physical activity in older adults. BMJ. 2015;350:h100. Jeannerod M, Decety J. Mental motor imagery: a window into the representational stages of action. Curr Opin Neurobiol. 1995;5(6):727–732. Grezes J, Decety J. Functional anatomy of execution, mental simulation, observation, and verb generation of actions: a meta-analysis. Hum Brain Mapp. 2001;12(1):1–19. Courtine G, Papaxanthis C, Gentili R, Pozzo T. Gait-dependent motor memory facilitation in covert movement execution. Cogn Brain Res. 2004;22(1):67–75. Personnier P, Kubicki A, LaRoche D, Papaxanthis C. Temporal features of imagined locomotion in normal aging. Neurosci Lett. 2010;476(3):146–149. Skoura X, Papaxanthis C, Vinter A, Pozzo T. Mentally represented motor actions in normal aging: I. Age effects on the temporal features of overt and covert execution of actions. Behav Brain Res. 2005;165(2):229–239. Bohannon RW. Reference values for the timed up and go test: a descriptive meta-analysis. J Geriatr Phys Ther. 2006;29(2):64–68. Wolpert DM, Ghahramani Z, Jordan MI. An internal model for sensorimotor integration. Science. 1995;269(5232):1880–1882. Wolpert DM, Flanagan JR. Motor prediction. Curr Biol. 2001;11(18):R729–R732. Desmurget M, Grafton S. Forward modeling allows feedback control for fast reaching movements. Trends Cog Sci. 2000;4(11):423–431. Gentili R, Cahouet V, Ballay Y, Papaxanthis C. Inertial properties of the arm are accurately predicted during motor imagery. Behav Brain Res. 2004;155(2):231–239. Bakker M, De Lange FP, Stevens JA, Toni I, Bloem BR. Motor imagery of gait: a quantitative approach. Exp Brain Res. 2007;179(3):497–504. Papaxanthis C, Schieppati M, Gentili R, Pozzo T. Imagined and actual arm movements have similar durations when performed under different conditions of direction and mass. Exp Brain Res. 2002;143(4):447–452. Kalicinski M, Kempe M, Bock O. Motor imagery: effects of age, task complexity, and task setting. Exp Aging Res. 2015;41(1):25–38. Carrasco DG, Cantalapiedra JA. Effectiveness of motor imagery or mental practice in functional recovery after stroke: a systematic review. Neurología. 2016;31(1):43–52. Hétu S, Grégoire M, Saimpont A, et al. The neural network of motor imagery: an ALE meta-analysis. Neurosci Biobehav Rev. 2013;37(5):930–949. Batson G, Feltman R, McBride C, Waring J. Effect of mental practice combined with physical practice on balance in the community-dwelling elderly. Act Adaptation Aging. 2007;31(2):1–18. Tunney NM, Arnold CE, Gimbel LM. Mental practice to facilitate learning when physical practice is unsafe: a pilot study. Phys Occup Ther Geriatr. 2011;29(3):243–254. Linden CA, Uhley JE, Smith D, Bush MA. The effects of mental practice on walking balance in an elderly population. Occup Ther J Res. 1989;9(3):155–169. Gentili R, Han CE, Schweighofer N, Papaxanthis C. Motor learning without doing: trial-by-trial improvement in motor performance during mental training. J Neurophysiol. 2010;104(2):774–783. Papaxanthis C, Pozzo T, Skoura X, Schieppati M. Does order and timing in performance of imagined and actual movements affect the motor imagery process? The duration of walking and writing task. Behav Brain Res. 2002;134(1):209–215. Jackson PL, Lafleur MF, Malouin F, Richards CL, Doyon J. Functional cerebral reorganization following motor sequence learning through mental practice with motor imagery. Neuroimage. 2003;20(2):1171–1180. Topolski TD, LoGerfo J, Patrick DL, Williams B, Walwick J, Patrick MAJ. Peer reviewed: the Rapid Assessment of Physical Activity (RAPA) among older adults. Prev Chronic Dis. 2006;3(4):A118. Borson S, Scanlan J, Brush M, Vitaliano P, Dokmak A. The mini-cog: a cognitive ‘vital signs’ measure for dementia screening in multi-lingual elderly. Int J Geriatr Psychiatry. 2000;15(11):1021–1027. Borson S, Scanlan JM, Chen P, Ganguli M. The mini-cog as a screen for dementia: validation in a population-based sample. J Am Geriatr Soc. 2003;51(10):1451–1454. Malouin F, Richards CL, Jackson PL, Lafleur MF, Durand A, Doyon J. The Kinesthetic and Visual Imagery Questionnaire (KVIQ) for assessing motor imagery in persons with physical disabilities: a reliability and construct validity study. J Neurol Phys Ther. 2007;31(1):20–29. Brach JS, Studenski SA, Perera S, VanSwearingen JM, Newman AB. Gait variability and the risk of incident mobility disability in community-dwelling older adults. J Gerontol A Biol Sci. 2007;62(9):983–988. Beauchet O, Allali G, Annweiler C, et al. Gait variability among healthy adults: low and high stride-to-stride variability are both a reflection of gait stability. Gerontology. 2009;55(6):702–706. Hausdorff JM, Rios DA, Edelberg HK. Gait variability and fall risk in community-living older adults: a 1-year prospective study. Arch Phys Med Rehabil. 2001;82(8):1050–1056. Shumway-Cook A, Brauer S, Woollacott M. Predicting the probability for falls in community-dwelling older adults using the Timed Up & Go Test. Phys Ther. 2000;80(9):896–903. Beauchet O, Launay CP, Sejdić E, Allali G, Annweiler C. Motor imagery of gait: a new way to detect mild cognitive impairment? J Neuroeng Rehabil. 2014;11(66). Beauchet O, Annweiler C, Assal F, et al. Imagined Timed Up & Go test: a new tool to assess higher-level gait and balance disorders in older adults? J Neurol Sci. 2010;294(1):102–106. Kalicinski M, Raab M. Task requirements and their effects on imagined walking in elderly. Aging Clin Exp Res. 2014;26(4):387–393. Rozand V, Lebon F, Stapley PJ, Papaxanthis C, Lepers R. A prolonged motor imagery session alter imagined and actual movement durations: potential implications for neurorehabilitation. Behav Brain Res. 2016;297:67–75. Gentili R, Papaxanthis C, Pozzo T. Improvement and generalization of arm motor performance through motor imagery practice. Neuroscience. 2006;137(3):761–772. Beauchet O, Launay CP, Fantino B, Annweiler C, Allali G. Motor imagery of gait in non-demented older community-dwellers: performance depends on serum 25-hydroxyvitamin D concentrations. Age. 2015;37(2):1–8. Saimpont A, Malouin F, Tousignant B, Jackson PL. The influence of body configuration on motor imagery of walking in younger and older adults. Neuroscience. 2012;222:49–57. Malouin F, Richards CL. Mental practice for relearning locomotor skills. Phys Ther. 2010;90(2):240–251. Driskell JE, Copper C, Moran A. Does mental practice enhance performance? J Appl Psychol. 1994;79(4):481–492. Wolpert DM, Kawato M. Multiple paired forward and inverse models for motor control. Neural Netw. 1998;11(7):1317–1329. Duysens J, Clarac F, Cruse H. Load-regulating mechanisms in gait and posture: comparative aspects. Physiol Rev. 2000;80(1):83–133. Abelew TA, Miller MD, Cope TC, Nichols TR. Local loss of proprioception results in disruption of interjoint coordination during locomotion in the cat. J Neurophysiol. 2000;84(5):2709–2714. Kim BH, Newton RA, Sachs ML, Glutting JJ, Glanz K. Effect of guided relaxation and imagery on falls self-efficacy: a randomized controlled trial. J Am Geriatr Soc. 2012;60(6):1109–1114. Chou C-H, Hwang C-L, Wu Y-T. Effect of exercise on physical function, daily living activities, and quality of life in the frail older adults: a meta-analysis. Arch Phys Med Rehabil. 2012;93(2):237–244.